Ever since I was a baby, the main problem with my skin has been eczema. I would scratch my skin raw until my mum bought me some hand mitts, but even now I still get flare-ups. I get it in the normal places, like behind my knees and in the crease of my elbows, but when it hits my face, then the struggle really begins. With my body I know I can just reach for my trusty Aveeno or Bioderma SOS Spray (the only products that soothe the itching while moisturising it), but with my face I feel like I need more than just those, seeing as I'm applying skincare products and makeup to it every day. Eczema on my face can get really itchy and irritated if I use the wrong products on it, so I've now started to look more into the products and ingredients I put on my face. One of those ingredients that have been helping me battle eczema a treat is hyaluronic acid. 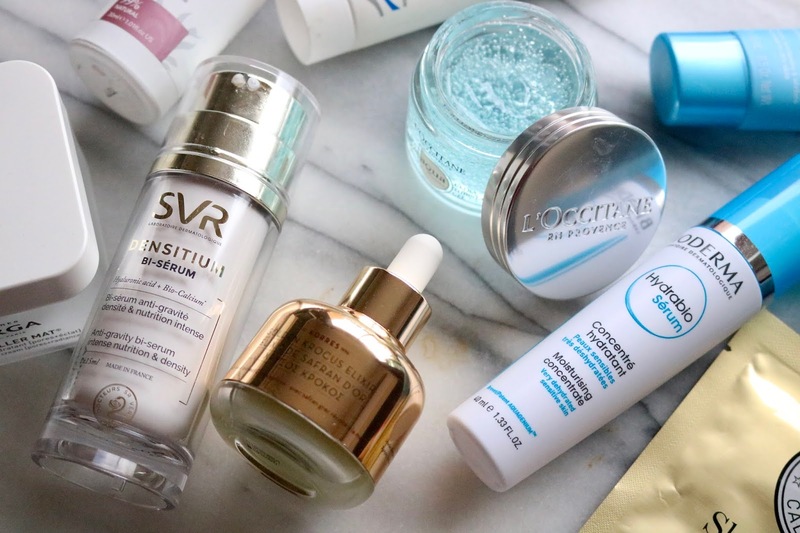 Unless you've been living under a rock or a huge pile of eyeshadow palettes, hyaluronic acid is one of the latest skincare wonders that has been taking over the market and after using products containing the molecule for the past five months, I can see why. Hyaluronic acid is a molecule that is actually already in our skin and helps make up the framework of our skin cells. This product is so fantastic at containing moisture as it can hold up to 1000 times its weight in water all while creating a protective barrier, meaning you'll be locking in moisture for longer. Let me give you an example of how it worked for me! 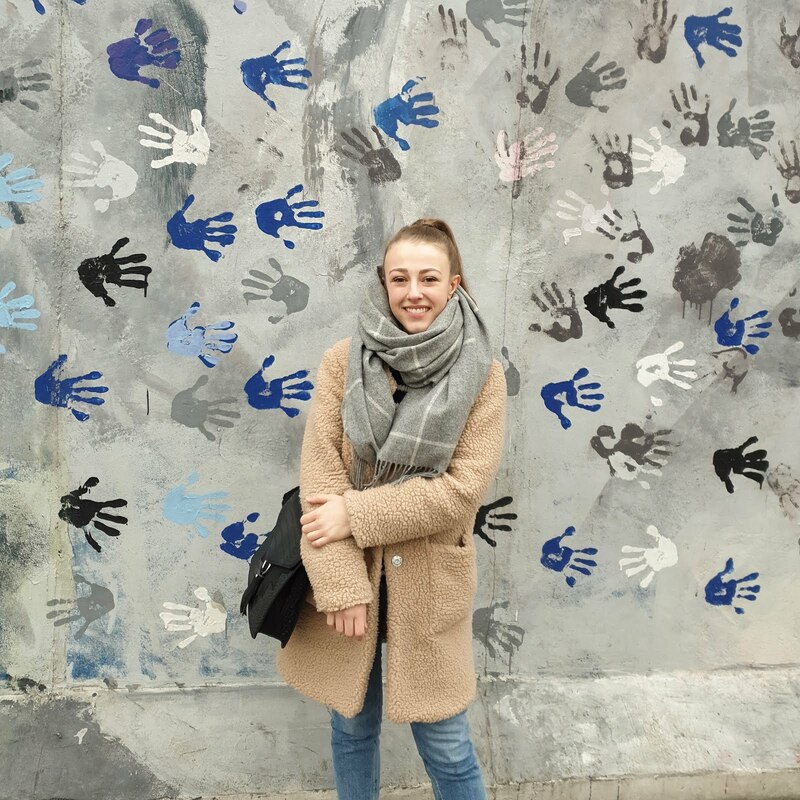 At the start of the year, my skin was going a bit bonkers- it hadn't really experienced a proper winter last year seeing as I spent most of it halfway across the world, so the eczema was quite literally slapping me in the face for it. I started to develop a random patch of eczema on forehead out of nowhere and I struggled for weeks trying to figure out how it had come about. However, all that while that I had been worrying, I should have spent thinking how I could treat the problem. Out of curiosity, I started researching hyaluronic acid after receiving some products containing it, and thought 'hey, this could work'. Once I started introducing it into my skincare routine, the patch of eczema vanished in a week. 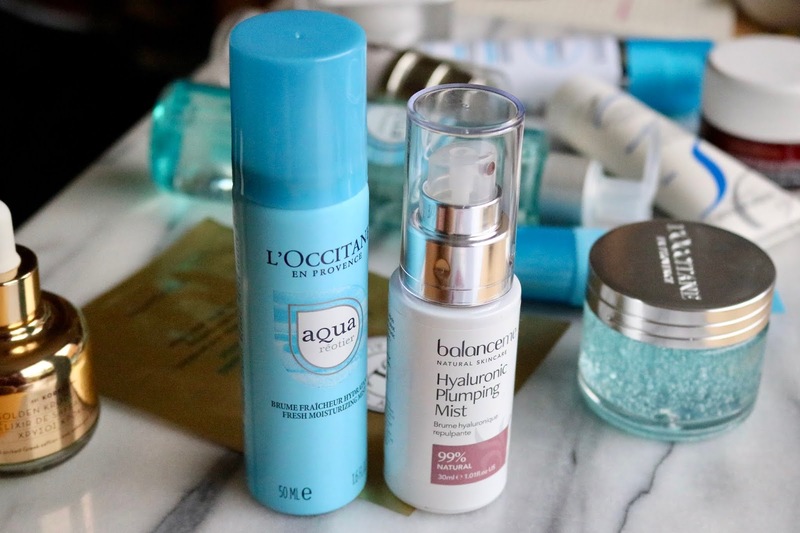 Now, hyaluronic acids are a part of my morning and evening skincare routines, and I've started to see the long-term benefits as well as the short term ones. My skin has been plumper and more alive in the mornings and has meant my foundation has been going on like a dream. One of the miracle-workers in this new range from L'Occitane, this cleanser is so refreshing to apply and leaves your skin silky smooth. You really feel you're adding moisture to your skin without clogging your pores, and that's thanks to the minerals and calcium in the cleanser from the Réotier spring in Provence. If you're looking to take a break from oil-based products, this could be the product to try out! I've always enjoyed using mists and sprays to keep my skin hydrated, and this plumping mist from Balance Me is one of my new favourites. Containing a natural alternative to HA, this helps soothe while encouraging the production of the HA in the skin. As well as using this as an on-the-go top up of moisture when travelling, I've also been using this sometimes as a toner to close my pores on days when I've had a flare-up of bad skin and it's done a great job of soothing it. Another moisturising mist that I know I'll be popping in my carry on for flights is this one from L'Occitane. Again from the Réotier range, this is not only refreshing to put on in the mornings and on the go, but also as a finishing spray for your makeup! As this is such a multitasker, this would be perfect for helping you travel light on skincare products. Moving onto serums- when it comes to skincare I know I can always rely on Bioderma to look after my sensitive skin, and the hydrabio serum has been amazing to use in the mornings to soothe and refresh my skin. The formula starts off as a gel and then melts into your skin like water, smoothing it out. I've really noticed a difference when applying my base products after using this, as I find it goes on a lot easier and blends well even if I have a few imperfections. This serum may be more on the pricier side, but it is honestly worth every penny. Aimed at fighting the signs of ageing, it combines both oil and gel formulas together to help increase collagen fibres and the skin's water content. One pump is all you need, and I found it sunk in really well without making my skin too oily like some oil serums can. This would be perfect if you feel like you need a moisture injection during the warmer months without having excess on the skin. Probably one of my fave new finds out of all of these is this gel serum from L'Occitane. This looks and feels like good old hair gel, but as soon as it touches your skin it sinks in without a trace! Much like the rest of the range I've talked about so far, this is super refreshing and cooling thanks to the little micro-bubbles which give your skin a fresh injection of moisture. Like some of these other serums, I was really surprised with how little you need- a tiny pea-sized blob will cover your whole face and neck! If you really want to dedicate yourself to your skincare, then splash out on this rather luxurious serum from Korres. If you hadn't guessed, the reason this is a bit more expensive than some of the other products here is that it contains fresh handpicked saffron extract from Northern Greece. Saffron is one of the most precious plants in the world and is known for its brilliant antioxidant power. This elixir is ideal for all skin types as it helps to add radiance (thanks to the little gold particles in it), strengthen the skin on the inside and outside, as well as fighting the signs of ageing. On the days I had this on my skin, I think I had some of my 'best skin days', and actually made me more excited than normal to do my daily skin routine. Helping to battle skin dehydration brought on by temperature and pollution, this Clarins moisturiser is a smooth cream that melts into the skin while protecting from the outside with SPF 15. According to research that Clarins did last year, our skin suffers up to 17 thermal shocks a day as we go from indoors to outdoors and from varying levels of humidity and temperatures. This actually affects our skins levels of hydration, hence why our skin may look dull and tired during the colder months after constantly going from freezing temperatures to heated buildings. This cream helps you get your skin hydration back on track and works really well with those who have normal to dry skin. This is a product that was probably my first introduction to hyaluronic acid, as I started using this last year during the winter months. It even made it into my regular winter skincare routine as it is a cream I always go back to if I'm having problems with my skin. Along with HA, it also has wheat proteins, which are great at soothing, as well as almond oil and beeswax to help protect the skin. 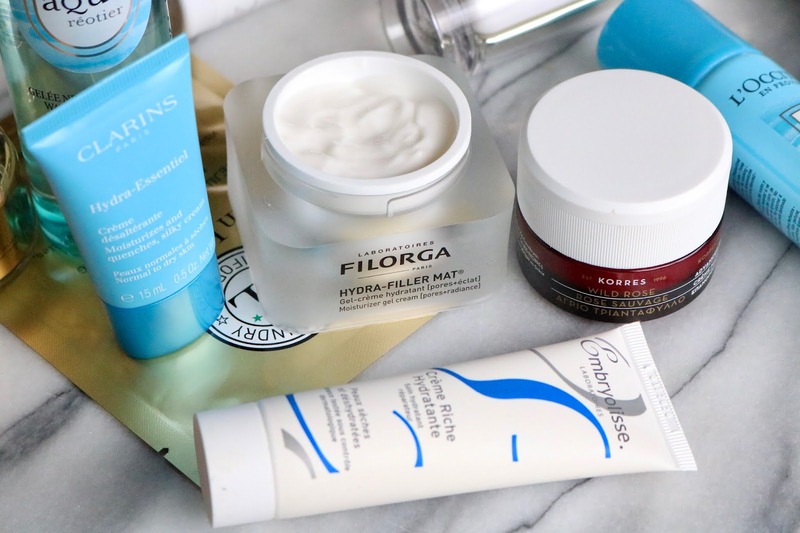 This Filorga moisturiser is all about hydration. The high-end cream is suitable for all skin types but it also prioritises mattifying the skin and reducing pores as well as giving it hydration. I'm currently trying this out long-term so will keep you updated as to whether this mattifies my skin more than normal as I can be prone to getting a little shiny. This really works hard for your money and is super light in consistency so it would be perfect to pop into your travel bag if you're going anywhere warm this summer. Much more than a mask or night cream, this sleeping facial from Korres uses wild rose which contains nine times more Vitamin C than an orange! The vitamin C along with the oil from the wild rose helps enhance natural cell renewal overnight while improving the texture of the skin. After applying this the night before, I would find myself waking up with ultra-soft skin with a silky protective barrier that had formed over the top layer. This again is a product that needs some long-term commitment from me, but one that I truly enjoy applying. P.S. it smells just like Turkish Delight! This last product is one of those products that seems like a bit of a novelty but turns out to work pretty well. I mean, I've tried everything from sheet face masks to hand masks, but never thought I'd see the day where I came across a neck and chest mask! However, it makes total sense to create something like this, as our neck area is one place we seem to forget about when it comes to ageing. 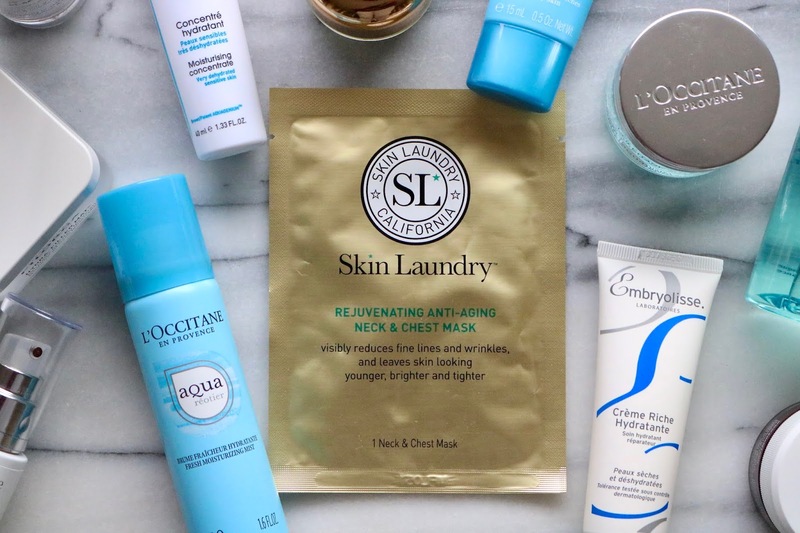 I've started to make sure I bring my skincare products down past my neck to ensure this area is getting properly looked after, and this mask from Skin Laundry is certainly helping with this. As well as hydrating the skin it also helps to preserve the firmness and elasticity of this area. This may be a product that I need to repurchase! I was introduced to this mask and the Clarins moisturiser through Indulge Beauty, which is almost like a mix between Sephora and Boots but for the UK market. Launched by the CEO of The Fragrance Shop, they have opened a new store in Westfield Stratford City as well as being online and stock over 120 brands. I've been really impressed so far with the brands and selection of products that they have, so I'm really looking forward to shopping more with them! I know this was a pretty hefty post but I hope you enjoyed reading this as much as I enjoyed creating it! Beauty is one of my first loves so when I came up with the idea to write this post I was super excited to delve into it. I just want to say a huge thank you to all the brands I mentioned in this post. They very kindly sent me these products to try out, which has meant I've been able to discover some new brands I may not have thought to try before and new products that I'll definitely be repurchasing in the future. 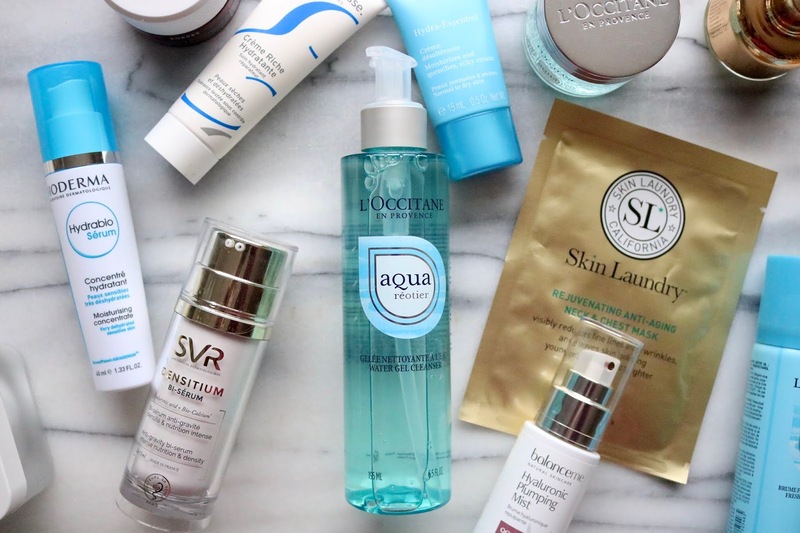 What are your thoughts on hyaluronic acid? 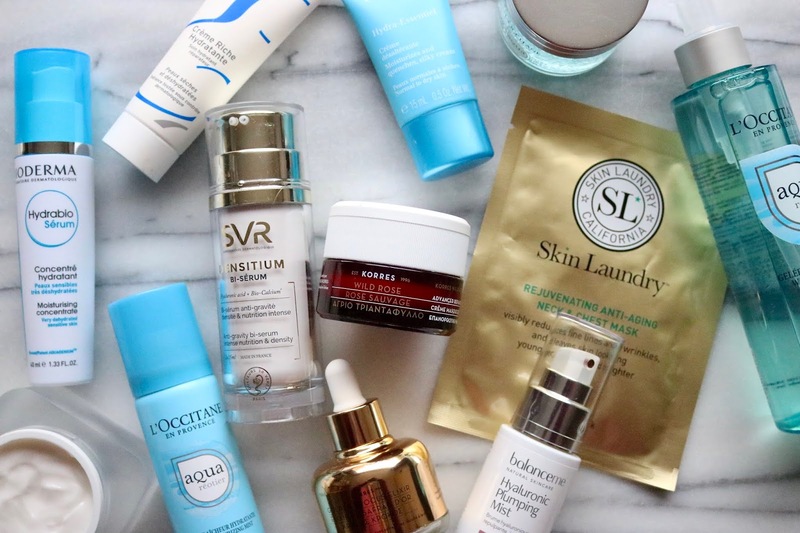 Have you tried any products with it in, and how has it affected your skin? I love this! My husband gets eczema through the dry season so we will have to try some of these! My daughters and I all suffer from bouts with eczema. I can't wait to try some of these products out! Would love to hear which ones you pick and how you get on with them! I am the same way. I love Aveeno for my skin but this last winter I had to do some research for the horrible patches of dry skin I was getting on my face. I started using a serum with hyaluronic acid and it really helped. I will have to look into your recommendations. How amazing is Aveeno?! Hope this helps! I'm prone to awful eczema flareups and I've been really struggling with patches on my face the past few months - I've got to say I've never tried anything with this in, I was always under the impression it's too harsh on eczema prone skin? Might have to give it a go.